Ask fellow campers about "Willowood Campground" and nearby attractions. Worth a side trip just to visit adjoining Rainbow Garden. You are encouraged to sample herb garden plants, children have a play house with toys in the children's garden, sculptures are lovely, flowers fragent and dense, rocking chairs, wooden chairs and benches to relax in. Campground well maintained with pull throughs and full hookups. 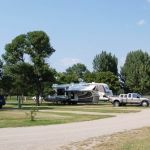 We camped at Willowood Campground in a Travel Trailer. Small 16 site city campground on the west end of Mayville on Hwy 200. Large signage and easy entry even for big rigs. Three pull-through sites. Moderate population of mature trees. Not much shade. - Utility connections in good shape. 15/30 amp. Regulator on faucet. Site had sewer. - Plastic picnic tables were warped by sunlight, but sturdy. - Picnic shelter with grill and a couple tables. - Bathhouse with single shower with coin box for quarters. Single toilet stall. Sink with no soap. Paper towels. - Boat access ramp and pier for nearby Goose River. - Song birds, deer, and rabbits were abundant. - Dumpster, drinking water at bathhouse, dump station Cons: - Noise nuisance from nearby airport during our stay. Frequent take offs flew right over the park during our stay. - Bright street lights in park interfere with night ambiance. - No camp store. No park personnel during our stay. - No fire rings and no local apparent firewood sales, even at the local Co-op. Fire pits were allowed, just not provided. - Moderate mosquito population from river. We camped at Willowood Campground in a Travel Trailer. Bike paths, fuel, restaurants, city pool, museum, and bars. Things zip up around 9 pm. Local radio station, post office, banks, police and fire, and Sanford Medical Center. Town has abundant flora and smells amazing. Are you affiliated with Willowood Campground ?